NBC 4 New York's Lauren Scala breaks down what Penn Station commuters need to know ahead of the papal visit Friday. She explains in detail about rail service for LIRR and NJ Transit commuters and offers options to help you avoid Penn Station. Penn Station will remain open all day Friday and during the Mass at Madison Square Garden. Only two entrances are expected to remain open -- one on the corner of 34th Street and Seventh Avenue and the other on Seventh Ave at 32nd Street beneath the Madison Square Garden Marquee. The MTA says customers should expect heavier than normal volume at these access points. Streets around MSG will begin to shut down on Friday at midnight and remain closed for as much as 24 hours. This includes 31st and 33rd streets between Seventh and Ninth avenues. Both Seventh and Eighth avenues will have several lanes closed. Some cross streets in the area will also be affected. The best ways to access Penn Station would be by taking the 1/2/3/A/C/E directly into the building or trying to access by foot. LIRR will operate on a weekday schedule with additional off peak trains during the day and after the conclusion of the Mass. NJ Transit rails will also operate on a weekday schedule with additional off peak trains. They will offer enhanced bus service in/out of Port Authority Bus Terminal. Expect long waits, sporadic closures of staircases and entrances and overcrowding, especially during evening commute, during security measures. LIRR commuters should consider traveling to/from Atlantic Terminal in Brooklyn where they can access the 2/3/4/5/B/S/N/Q/R subway lines. 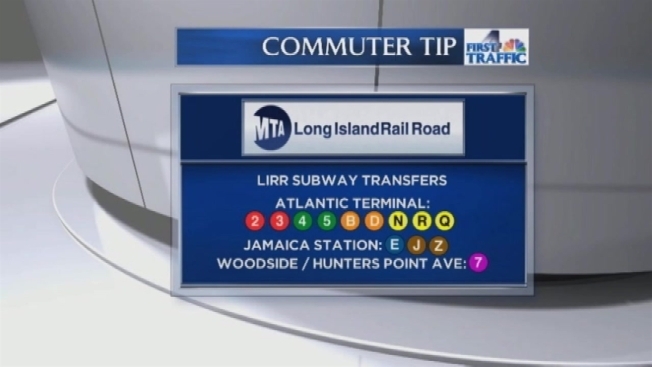 Commuters can also connect to the E/J/Z trains from Jamaica Station and the 7 train from Woodside and Hunters Point. NJ Transit customers can use rail service to get to/from Newark Penn where they can then utilize PATH rail service. Commuters can also take NJ Transit to the Hoboken Terminal to connect to PATH trains and NY Waterway ferries. PATH will offer extra service on HOB - 33 and JSQ - 33 lines on Friday. Buy round trip tickets and Metrocards ahead of time so you don't wait in long lines at the machines. Click here for a complete list of street closures and traffic changes and here for the MTA's guide to bus routes. 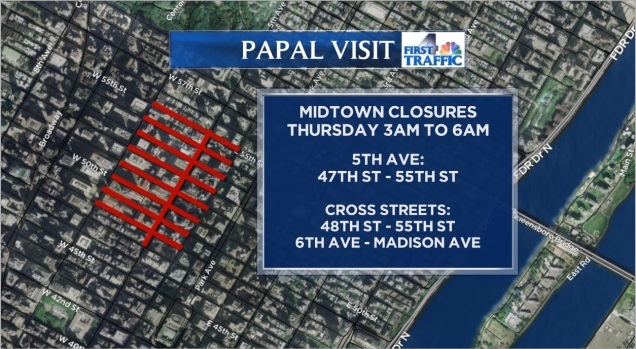 For everything you need to know about how Pope Francis' visit will affect you, click here.